At six foot six, Jim McCue stands head and shoulders above the sea of 'stick to the script' club comedians. Jim blends thought provoking material and uncanny improv skills with a style that actually encourages audience participation. 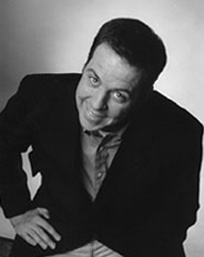 Featured on Comedy Central, Comcast Comedy Spotlight and at the Boston Comedy Festival, and most recently, entertaining our troops in Iraq, Jim's versatility makes him perfect for any venue; clubs, colleges, corporate, television or film. The Boston Comedy and Movie Festival is the brainchild of founder Jim McCue. The 6th Annual Boston International Comedy & Movie Festival takes place September 8th through 16th, 2006. For six days, 150 comedians will come together from across the globe to share their talents and celebrate the rich culture that the city of Boston has to offer - and 96 of them will compete for the honor of being the Best Comedian and $10,000!